Wee Cook Wednesday: Thanksgiving Treats to Try! Looking for something a little different to spice up this holiday feast? This weekend I’m going to be creating three gingerbread houses and umpteen gingerbread men for Boosters, so I thought I should get a couple of posts up while I have time… So “Wee Cook Wednesday” is up a bit early, to allow you to go out and get your feast underway! Below I’ve included two recipes: one for a fabulous “Spinach Pie” that calls for phyllo dough (the trick is use LOTS of butter, and don’t leave it uncovered too long) and a full pound of feta cheese. The other is for a spicy cranberry chutney that I found in the AnnArbor.com, courtesy of Food Editor Teresa Shaw. For those seeking a little more adventure than the lump of crimson that comes out of the cranberry can to go with their turkey. The first recipe, from the “South Arbor Family Recipes” book, is a wonderful Greek dish that had both my husband and kids gobbling with impressive speed! Butter bottom and sides of a 12×18 jelly roll pan (I used a 9×13 casserole and it worked fine). Set aside. Pour 1/4 C butter in frying pan, add onions and saute until golden. In large bowl combine cheeses, spinach, farina; stir in onion mixture. Add eggs gradually, stirring constantly. Season with salt and pepper, set aside. Roll out phyllo dough and cover with plastic wrap and damp tea towel. Put remaining melted butter in small dish and get out a pastry brush. Place 1-2 sheets of phyllo in jelly roll pan, allowing ends to hang over side. Brush with butter, then add additional layers of phyllo, brushing each layer with more melted butter. Pour spinach mixture over all, and fold ends of phyllo back over cheese mixture. Brush the ends with butter. Place remaining pastry sheets over cheese mixture, continuing to brush with butter over each layer. Score top sheets for ease of slicing after baking. Bake 325 for 45 minutes. Serves 12-16. (Or 6-8 if they’re REALLY hungry). 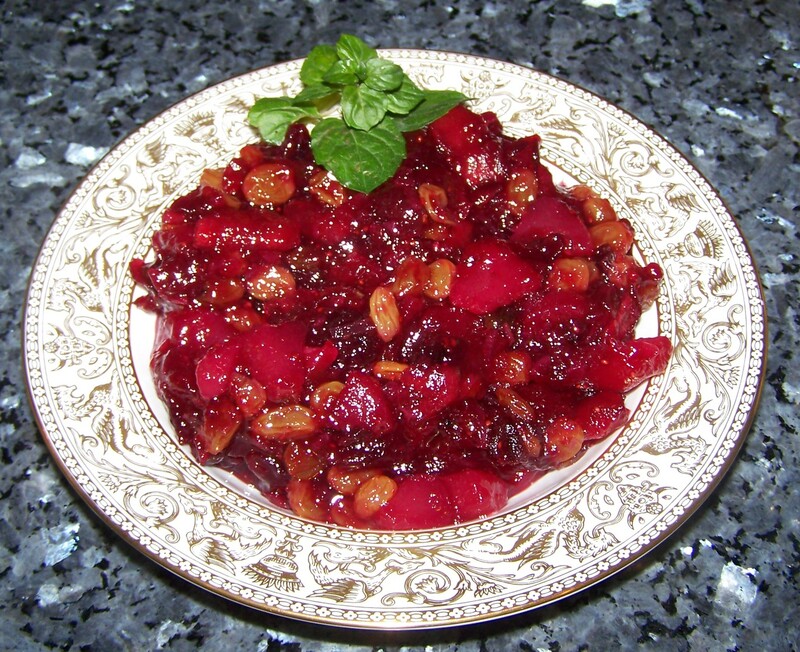 Cranberry Chutney (courtesy of Teresa Shaw of AnnArbor.com). Place all ingredients in a medium saucepan and bring to a boil. Reduce heat to low and simmer about 25 minutes, until cranberries have begun to cook down and chutney has thickened. Place in airtight container and serve within a week — or freeze or can to keep it longer. This entry was posted in Wee Cook Wednesday and tagged Cranberry Chutney, South Arbor Family Recipes, Spinach Pie, Weekend Wednesday by heidihesssaxton. Bookmark the permalink.